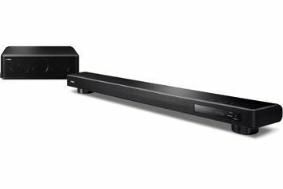 Yamaha launches YSP-2200 sound bar with HD and 3D support | What Hi-Fi? The slimline system comes complete with HD audio decoding and 7.1-channel sound processing, three HDMI 1.4a inputs for 3D support, and a height adjustable, compact subwoofer. The YSP-2200 uses Yamaha's digital sound projector technology to direct multiple beams of sound around your room in order to reach the listener from various angles and create a surround sound effect. An integrated 132-watt digital amplifier drives all the channels, encased in an aluminium body that stands just 79mm high and has height-adjustable feet, as does the subwoofer. The YSP-2200 hass three HDMI 1.4a inputs and one HDMI output, complete with audio return and support for 1080p and 3D content. Yamaha's IntelliBeam calibration system is included, while there are optional uinversal docks, including the YID-W10 wireless dock system that uses Yamaha's AirWired technology to send audio straight from your iPod/iPhone. The Yamaha YSP-2200 is due on sale in November and will go on sale for £799.